Mt. 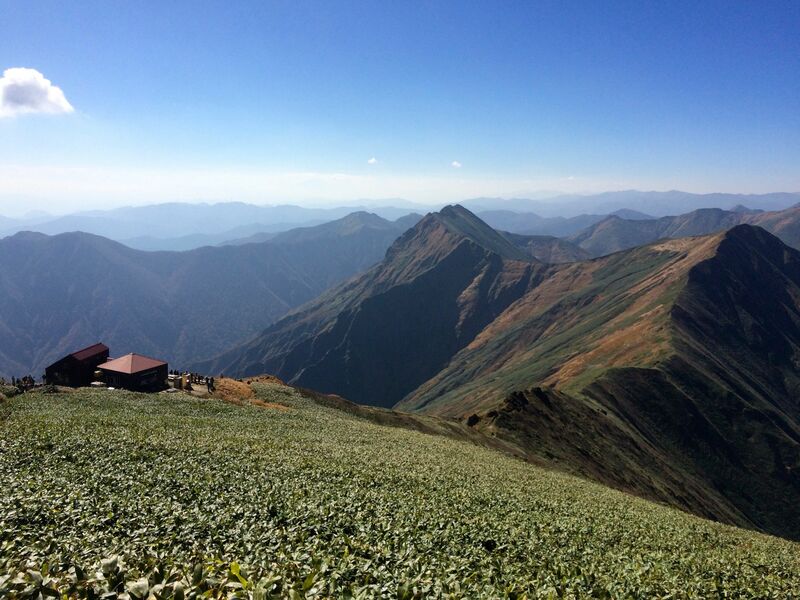 Tanigawa is a rocky peak sitting complacently on the border of Gunma and Niigata Prefectures. Notorious for its nasty weather and head deep snow, the mountain affords wonderful panoramic views and an abundance of plant life. The hike: From Doai station, head out the front door and turn right on the paved road. Walk uphill about 20 minutes and you’ll come to the Mt. Tanigawa gondola. Take the gondola if you’d like to save 600m of vertical climbing. Otherwise, take the gravel service road that runs to the left of the gondola. This road will take you all the way to the top of the gondola, and it should take around an hour or so. The trail actually branches off this road about halfway up, but you can ignore the actual trail and follow the road toward the left to get to the ski resort. It’s much better to go directly to the ski resort so you can fill up on water in the rest house, as there’s no other water source on the hike. The trail runs in front of the rest house, and then away from the ski lifts toward the rocky peaks of Mt. Tanigawa. It should take about 45 minutes to reach the emergency hut at Kuma-ana sawa (熊穴沢避難小屋). From the hut, turn right and start the real climb toward the summit. There are a few areas with chains to help you on the narrow ridge line, but all in all it’s not too treacherous. You’ll reach the hut just below the summit in about 90 minutes. If the weather is good then the views will be stunning. If not, then take extra care on the knife-edge traverse over to the high point. The summit has 2 twin peaks. The first one you’ll come to is called Tomanomimi (トマノ耳), while the higher peak is called Okinomimi (オキノ耳). After scaling the two peaks, you could continue traversing along the ridge or go back the same way you came. There are also 2 other alternative ways off the mountain. The first one is to take the trail leading away from the hut. This trail is very rocky, with lots of chains and ladders, which probably makes for a safer ascent than descent. The other alternative is to retrace your steps back to the Kuma-ana hut, and take a right. This trail will eventually dump you out at Minakami station (水上駅). I ended up flying back down to the base of the gondola to escape an incoming rainstorm. Grab a map and explore the vast network of trails that this legendary peak has to offer. When to go: This hike can be done year round if you’ve got an ice axe and crampons. Be especially careful of avalanches in the middle of winter, and be prepared for tons of snow until at least the rainy season. Access: From Echigo-yuzawa station (越後湯沢駅), take a local JR train bound for Minakami (水上) and get off at Doai station (土合駅). Map: Click here. In addition, you can find a couple of beautifully illustrated free maps here. Scroll down to the bottom of the page and download the .pdf files. This entry was posted on April 9, 2008 at 10:55 pm and is filed under Gunma hikes (群馬県), Niigata hikes (新潟県). You can subscribe via RSS 2.0 feed to this post's comments. I discovered your website today and am excited to find a good resource for hiking in Japan. Did this hike yesterday, took the Shinkansen from Tokyo station at 06:16am and transferred in Echigo Yusawa and arrived at Doai station at 08:38am. Walked 20-25 minutes to Tanigawa rope way , went up to Tenjin Daira ski field, started the hike at 09:30am, it took 45 minutes to the hut at Tenjin Toge, it was quite crowded, early on it was quite easy, the chains and rope became common. From Tenjin Toge to Kata no Koya ( Shoulder Hut ) was approximately 90 minutes, this was great and relatively not so difficult. Quick break and lunch at shoulder hut for 20 minutes then carried on to Toma no Mimi peak ( 1963) this took 10 minutes, carried on over to Oki no Mimi ( 1977 ) which took about 30 minutes narrow track, chains involved. Carried on from Oki no Mimi to Ichi no Kura Dake ( 1974), not so easy chains, slippery and steep, this took about one hour. Had a break at Ichi no Kura Dake next to the emergency hut which is basically a water tank cut in half and can just hold three, fire pit by the door for cooking but you would need to keep the door open so as not to asphyxiate while cooking. Left Ichi no Kura Dake around 2pm and carried on to the highest point which is Shige Kura Dake, this took about one hour. Good hut here, water source near buy, toilets and etc, surprised to see sleeping bags and mats inside for emergencys. Left Shige Kura Dake at 3pm, my plan was to make the last train from Tsuchitaru station bak to Echigo Yuzawa at 18:01 or call a cab at the end of the hike. My understanding it was a 2-3 hike to Tauchitaru station, this was when it got real tough, the trail was so rugged and treacherous it made going tough. It was soon apparent that it was going to be a taxi. Half way down there was a rest point which took about one hour and forty minutes to reach. At this point it said it was another one hour and forty minutes down to the end of the hike, at this time it was around 5pm. Fatigued and tired after 90 minutes it got dark, the trail was very steep and rugged whick rocks and called trees abundant at 18:30 and a tired hiking buddy who could barely walk it started to get hairy. 4 liters of water gone, no food left, constant sweating due to the humidity caution was key. By 19:15 it was totally black, the torch came out between the two of us, turned on my mobile and got on to google maps, we weren’t even close to Tsuchitaru station. All water gone, step by step descent still rugged as hell it was complete survival mode, we lost the trail once and had to go back. Finally we could see the service area by the highway and cars on the highway in the distance, but that was still a couple of hundred meters below us. My guide book mentioned you could hitch hike from there ( you cannot access it from the end of the hike, trust me. ) We eventually popped out the end at 20:15 totally exhausted and dehydrated. It was rugged to the end, near the end we spotted a taxi companies sign stapled to a tree so we gave them a call. ( 025-784-2660 ) the call out fee was a hundred yen and he drove from Echigo Yuzawa which was about 20 minutes away. We jumped in and asked him to stop at the nearest vending machine on the way to the station to rehydrate. Being Japanese he asked f we would like to go to the public bath 200 meters from the station, I said no thanks the station will be fine. In the air conditioned cab five minutes later I came to my senses and asked him if we stunk. His reply was you guys reek. So we went the the public bath (sento) and paid 400 yen for shower wash and a quick dip in the bath with a couple of old geezers. Luckily I took change of boxer shorts and socks the rest stayed on. The taxi cost 4000 yen and was a life saver. Walked two minutes to Echigo Yuzawa station and was on the next bullet train back to Tokyo, departed at 21:39. Last train leaves at 22:20. All the rice balls and sandwiches were gone so we had a can of Asahi beer and some nuts, got back to Tokyo just after 23:00. Thoroughly enjoyable but I would change the following things. From Doai station side to Tsuchtaru. Get to Doai earlier, at the top of the Tanigawa rope way I would take the ski chair lift up another 200 meters in ascent and walking horizontally to Tenjin Toge instead of vertically. Take more water, 4 liters was not enough or replenish from the water source behing Shige Kura Dake, allow extra time from Shige Kura Dake out. But ultimately, I would do the whole hike in reverse and start at Tsuchitaru and hike up to Shige Kura Dake and stay one night. Going all the way over to the Tanigawa Dake rope way could be tricky as it closes at 17:00 I believe. It was much easier going up than down and the descent from Shige Kura Dake rugged, steep and far from what I would call at track, better to attack this first. http://www.hyperdia.com was great for scheduling trains. Leonard, thank you for that very sobering report. Doesn’t sound like a “moderate” hike, as rated by the guidebook. I’m thinking of turning this into an up-and-back return hike, to avoid the very long and bad part you described, descending from Shigekura Dake. What’s your thought on how the hike would be to go up to Oki-no-mimi, and then just return down via Tenjindaira. How long do you reckon that would take? Allow 20 minutes from Doai station to the rope way entrance, another 20 minutes from there to Tenjin Daira. The description was quite accurate above, 45 minutes to Tenjin Toge the another 90 minutes on to Kata no Koya. You can buy water and drinks here, 400 yen for a bottle of kirkland water (500ml) from Costco. It takes less than 10 minutes on to Toma no Mimi from here. Toma no Mimi on to Oki no Mimi was about 30 minutes. I would allow the same time to get back down because most people coming back down when I was going up let me people ascending have first right to the track. Back tracking back to Tanigawa rope way and catching the bus from there to Minakami. Check times from Doai to Echigo-Yuzawa and Doai to Minakami. If you take the track down from Toma no Mimi I would be graceful to hear about your experiences. Sorry, I didn’t read your initial question correctly. From Tenjin Daira to Oki no Mimi and back again won’t be that tough in my opinion. The hardest part of this hike will be from Tenjin Toge to Kata no Koya in my opinion. Tenjin Daira to Oki no Mimi and back again 5-6 hours, 6 on the extreme safe side. I think the most ideal way to do this mountain as a day trip from Tokyo is to catch the train to Doai station, get to the ropeway station around 9am. 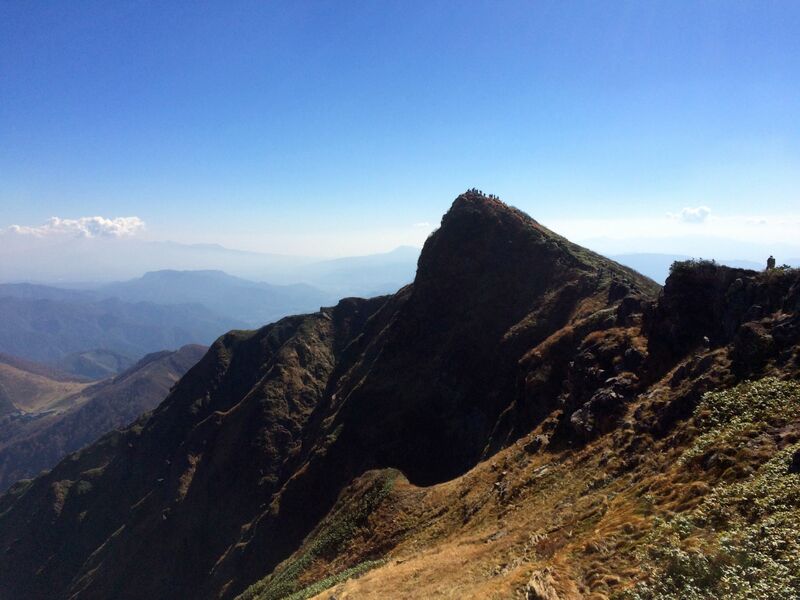 Instead of going up the ropeway, take the westerly trail that goes up the ridge to the summit. You’ll have fun pretending to be a real mountain climber when you tackle the steep sections, but as mentioned in the article there’s apparently lots of chains and ladders to help you. Then take the south-easterly trail down to the top of the ropeway, and take the cable car down to where you started. The map says around 6 hours for such a route: 4 hours to the summit, 2 hours to the ropeway. Catch a bus back to Minakami station or a train from Doai station. Will try this out myself in a few weeks when the weather is clear. So it’s doable as a day trip from Tokyo, but it’s a long day. My muscles are pretty sore today! Beautiful photos. I did this climb many times. Thanks for the helpful report. My husband and I were able to summit today after using the gondola to get us started. Post typhoon clear skies never came but the fall colors were nice near the summit. Slippery but very doable. Thank You for this little very accurate account. Tanigawa still remains as my favourite mountain to hike. If you weren’t able to see the glorious views please climb to the summit again. On my first hike we had only a glimpse as clouds parted. But over my years living in Gunma I climbed Tanigawa many, many times exploring the mountain from all directions and during all seasons except winter. Thanks so much for your reminder if Tanigawa. Hi everyone, is it possibe to do this hike in beginning of june without ice axes and crampons? Yes. There will be snow on the top face but usually soft and hikable.